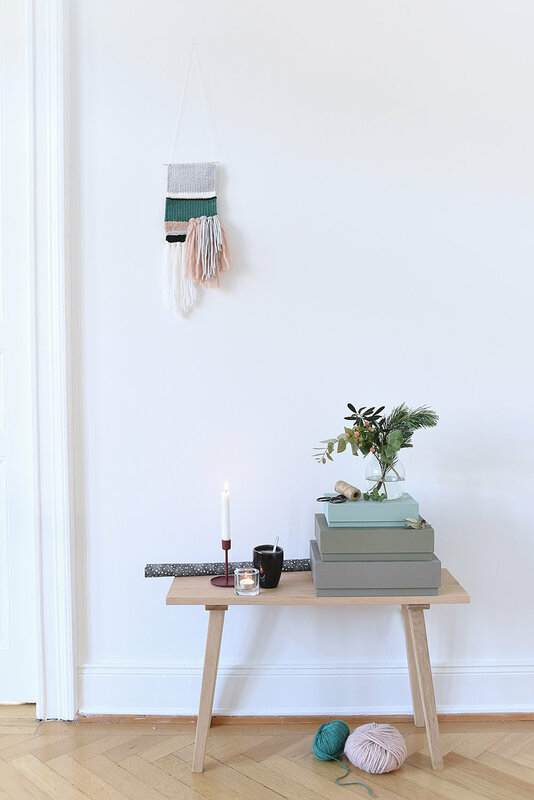 Hello decor8 readers, this is columnist Anke with my monthly column so please have a look at my recent dining room tabletop styling if you'd like. I've been inspired recently by a short trip to Finland. While doing window shopping I spotted interior design in moody colors like bordeaux, marsala, dusky pink, mossy green, grey and black everywhere. Though this isn't your typical Christmas motif, and now Finland is decked out in the most traditional holiday colors, my trip last month still left an impression on me. I really enjoyed to see these dark shades in combination with plain Finnish design -- they just know how to create a relaxed and calm atmosphere, right? 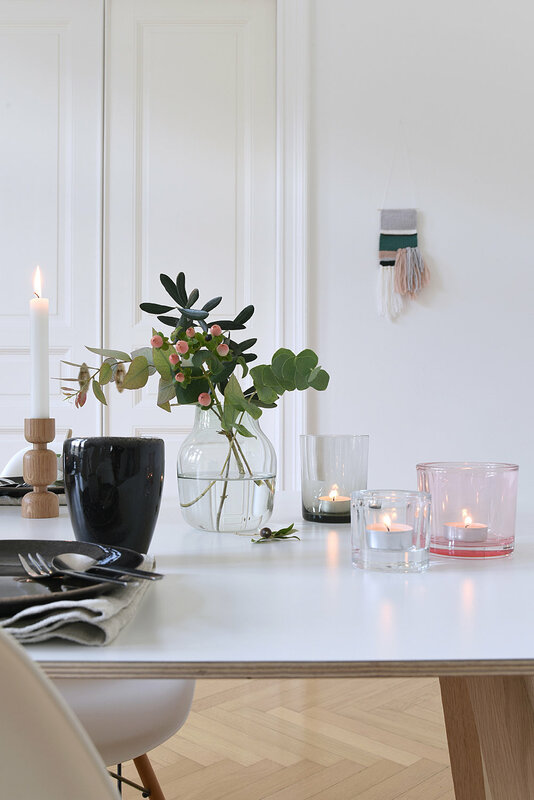 I thought to bring my impressions onto our tabletop at home by using candle and tea light holders in different shapes and sizes, made of glass and wood. Furthermore on my table - this season's most popular ceramics - tableware in black, the "black coal" series by Broste Copenhagen. I found it at my dear friend's online shop Wunderschoen Gemacht. Instead of flowers, I decided on different branches which I will now use for making Christmas wreaths. 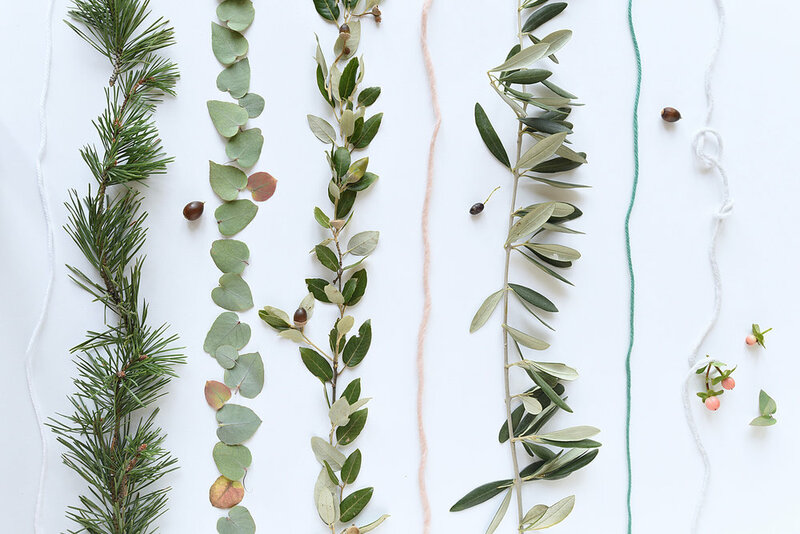 I picked eucalyptus, olive, pine and twigs with tiny acorns and pale pink berries and I liked having them in a vase until I have to cut them into small bunches for the wreaths. Last but not least, a salted dark chocolate tarte with whipped cream and red berry sauce went on the table and made me happy. I am really into sweets with a salty twist and love dark chocolate desserts combined with red berry anything! The berry sauce you see on one of my pictures is the easiest ever. In Germany we have a classic called "Rote Grütze" which is a compote of red berries you can buy ready to eat in every supermarket. I just put this one into my blender and mix it until smooth, that's it. Sometimes one is allowed to take the easy way out, agree? It's impossible to finish this post without giving thanks to Holly for my highlight this month! Your book party launching "Decorate for a Party"/ "Feierlaune" ($12 on Amazon this week only!) in Hannover with so many inspiring guests, a beautiful table decoration and those blissful cakes by Mundus was such a treat, dear Holly! It was so great to have spent time with you and I enjoyed very much!